How do you enjoy your time at sea? Fishing, sailing, skiing, wake boarding, or family days on the water? Whatever your favourite past-time, staying safe and meeting the legal personal floatation device requirements for your state is made easy and affordable with the lightweight Watersnake Inflatable PFD Level 150 yoke. The Watersnake Inflatable PFD Level 150 is designed to meet the latest AS4758.1 stringent safety rating, is comfortable to wear all day if needed, making it a great option for fishing boats, sailing boats and for general boating. The compact design makes it easy to stow without taking up valuable storage space on your boat. It’s a great rock fishing lifejacket, too. The Watersnake Inflatable PFD Level 150 Foul Weather Offshore Yoke is designed for all-day comfort, with a soft neoprene neck-liner to avoid irritation or chaffing on the back of your neck. It is designed to wear over your fishing or sailing clothes and has a large 50mm webbing belt with a twin-tab synthetic nylon buckle for quick and easy fitting. The Watersnake Inflatable PFD Level 150 is designed flat for easy storage and has a manual inflation system that is easily activated by pulling down on the toggle to initiate the release of the 33g CO2 gas cylinder. There is also a mouthpiece for oral inflation. 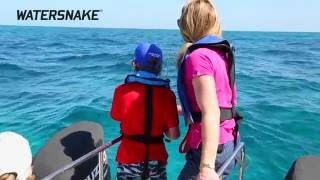 Watersnake Inflatable PFD Level 150 lifejackets are designed for general offshore and rough weather use, where a high standard of safety and performance is required, such as when fishing offshore, and they're equally safe for fishing inshore waters, estuaries and freshwater lakes. They are designed to maintain a fully clothed person in a safe position on their back with their head clear of the water without any action required by the user. They are now also available in six colours: black, blue, red, racing-car green, lilac and camo.